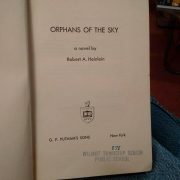 Robert A. Heinlein’s 1963 fix-up novel, Orphans of the Sky, was originally published in two parts, Universe and Common Sense, in 1941. I have chosen it for my 100th Because My Tears are Delicious to You review both because it was extraordinarily influential on a very specific subgenre, but also because it happens to be an important book to me. More on both later. Hugh Hoyland has lived his entire life in the Ship. Indeed, he cannot imagine a life elsewhere, because as far as he and his people are concerned, the Ship is the whole of the universe. An inquisitive young man, his curiosity and native intelligence win him a place as a Scientist, one of the aristocrats of the Ship. Lucky for him, because the alternative destination for inconveniently curious young men is the converter, where their dissolution will provide power to the Ship. Hugh’s curiosity proves his undoing; his exploration party is ambushed by Mutes and he is left for dead. His story does not end there. Unlike most Muties captives, Hugh is not killed and eaten. He is given to the two-headed Mutie leader Joe-Jim as a personal slave. Joe-Jim, two of the few literate people in the Ship, has spent their long life painfully reconstructing the lost history of the Ship from the few books that remain. Because they see in Hugh the same potential that the Scientists did, they share with Hugh what he has learned. Launched in 2119, the Ship, or the Vanguard as it was originally called, never reached Far Centaurus; the 2172 mutiny made sure of that. Most of the population died, including everyone who had an inkling how to navigate the ship, and the Ship has drifted for centuries. The faction who eventually became Hugh’s people control the outer part of the great cylinder that is the Ship. The descendants of the mutineers1 control the inner sections. The Ship’s builders, the Jordan Foundation, built for durability and longevity. All of the Ship’s vital systems have continued to function long after the last person who understood them died—which is indeed lucky for the ship’s current inhabitants. Not only are the life support systems functional, so are the propulsion systems. If someone could restart them and navigate the Ship, the wayfarers could finally make port in a habitable star system. All that someone would have to do is to relearn skills lost for centuries, convince the ruling elites that their religion is completely wrong, and unite two murderously hostile factions. How hard could that be? Personal significance first: in 1970, my father took a sabbatical at Brazil’s Federal University of Santa Catarina. We flew down, but because it was too expensive to transport books that way, our school books followed us by boat. Slow boat. It took months for our books to show up. For some reason it never occurred to us to see if the University library had books in English—it did—so we had a long, long drought in which we had nothing to read. Nothing. Now, a lot of people in our shoes would have used the time to explore the tropical island around us. And we did. I can show you scars! We also filled the time with shortwave radio, singing folk songs of the sort that could get you deported from Canada, and telling stories. One day my older brother Scott told Orphans of the Sky, from memory (paralleling a scene in the book itself). That was my first introduction to Robert Heinlein. I have not asked Scott where he first encountered Orphans, but I would bet that the copy he read was the hardcover edition that Wilmot Senior Public School used to own until some miscreant neglected to return it in 1975. It seems to me that an absolute prerequisite for recruiting people to staff generation ships is that the recruits must never have read any story set on a generation ship, because if they were familiar with stories set on generation ships they would know that they were consigning their descendants to miserably constrained lives, social and genetic degeneration, rampant mutation, and fair odds of being wiped out by some unforeseen hazard of deepest space. Now, Robert Heinlein was not the first person to write a story about a generation ship that suffered a mutiny in mid-trip—as near as I can tell that was Murray Leinster in his 1935 “Proxima Centauri”—but I think it safe to say that Heinlein was by far the most influential author to write such a story. For decades after Orphans of the Sky was written, author after author launched doomed ship after doomed ship into the depths of space, where one by one each craft recapitulated the events of Orphans of the Sky2. I am hard pressed to name another subgenre of SF where an early work was so influential; it is much easier to name the handful of generation ships that ended up at their original destination than it is to list the ones that ended up drifting in space. 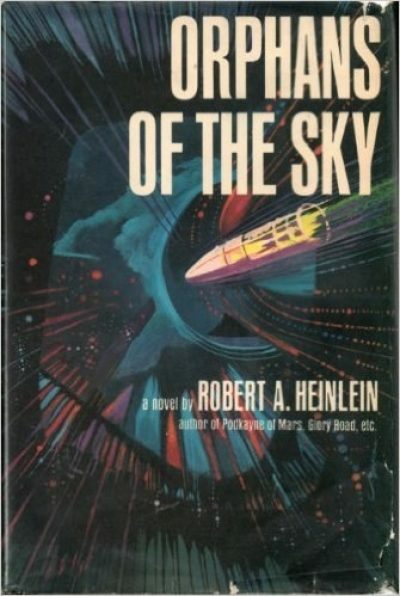 Universe is one of the handful of Heinlein works that made it in altered form onto radio. In keeping with the general pattern of Ernest Kinoy and George Leffert’s adaptations of classic SF works, the Dimension X andX Minus One versions are considerably more downbeat than the original Universe. What makes the success of this trope more impressive is that, strictly speaking, this isn’t one of Heinlein’s better books3. The ending in particular is needlessly weak. Heinlein goes on and on about the unlikelihood of a happy ending for Hugh and his companions. But … this is one of the rare examples of early SF that explicitly featured extensive shipboard automation; the machinery worked as planned, both for life support and for navigation and landing. All Heinlein had to do was credit the automation for dealing with the pesky details of finding and landing on a habitable world4. Oh, well. Despite its flaws, the book remains a compelling tale. Orphans of the Sky is available in a variety of editions, from affordable ebook to somewhat less affordable Virginia edition. 1: The Mutie faction is also where people with visible mutations end up. It is not clear if Mutie began as a short form of mutineer or mutant. 2: In the case of Baxter’s dreadful Mayflower II, despite being well aware that all generation ships are doomed. In defence of the people who launched the MII, not only were they on the run, but people in Baxter stories are spot-welded to Idiot Balls. 3: The treatment of women in this story is weirdly misogynistic, given that other Heinlein adult works allowed women a fair bit of agency. (His juveniles … well, that’s a different story.) Heinlein had some fairly fixed ideas about what women could or should do, but that didn’t prevent him from writing women who take active roles as leaders and adventurers. Not here. Here women are explicitly chattel to be battered into obedience. They do not even own their own names; the men who own them pick what to call them. I am going to interpret this as a sign of how barbaric Hugh’s people are. 4: And in fact, the ship’s systems do take over for the final stages of the landing.